With the news of an iceberg the size of Delaware calving from Antarctica, fears of accelerating warming and its consequences grow. Bill McKibben writes in Rolling Stone about how to know if your representatives in Congress are serious about action on climate change, or if they are beholden to the fossil fuel industry. 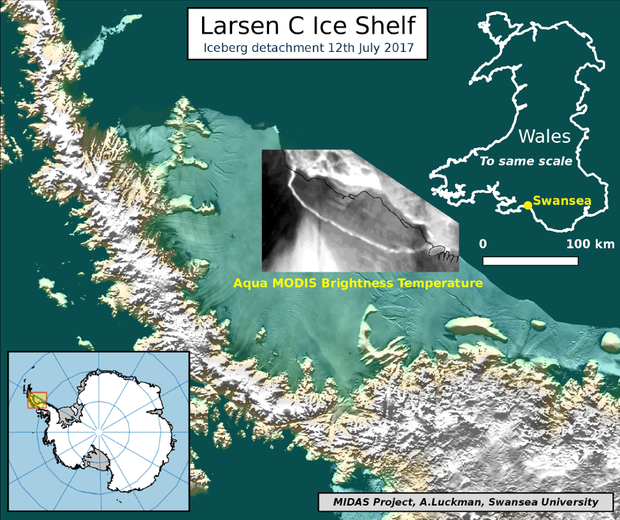 A map shows the detachment of an iceberg from the Larsen C Ice Shelf in Antarctica, based on data from NASA's Aqua Modis satellite, July 12, 2017. If your company or community have made commitments to 100% renewable energy or other goals for sustainability and resilience, how are you tracking your progress? Minerva is pleased to be working with FigBytes and their on-line platform for strategic and results-oriented sustainability. Let us know if you would like a demonstration. What actions are you taking? Please share them in the comments section. We are all in this together.